Pazham Pori aka Ethakka appam is a favourite snack of Keralites. The ripe Kerala Banana (Ethakka) is coated with flour batter and deep fried in oil. It is irresistible for most Malayalees and whenever one sees the yellow covered pazhampori in the glass compartments in small tea shops, you just succumb to temptations. This is also a Thattukada specialty; Kerala street food, like Thattukada Chicken fry, Parotta, Uzhunnu Vada, Parippu Vada etc. Do check my chicken cutlets, samosas, spring rolls, Paneer fingers, soya cutlets, fish cutlets, Calamari fritters, Beef strips etc. Since the batter for Pazham Pori is usually made with Maida, many healthy alternatives like wheat flour, Oats, Rice flour and even Rava(Sooji) coated versions have surfaced. Still, healthy or not, Keralites remain die hard fans of this fried snack – Pazham pori aka ethakka appam. Ripe but firm Bananas are considered good for making Pazham Pori. 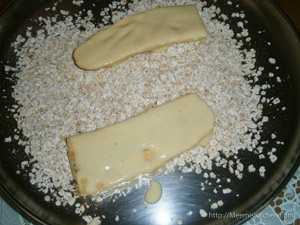 It is cut length wise into thin slices and dipped in batter and fried to golden brown. However, you can cut into rounds (if you have limited bananas and you need more numbers) or mash it and add to the batter and fry small balls. 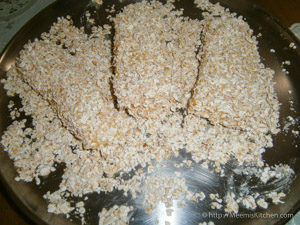 Oats coated Pazham Pori is the latest trend. It is healthy and crispy and the kids just loved it! The only issue was that it spoiled the oil and I had to change the oil after frying half of it. So, I changed the recipe by mixing oats along with batter and it came out delicious. The oil was not spoiled and the taste was excellent. Adding a small amount of rice flour also makes it crispy. Enjoy crispy Pazham pori with a cup of Tea or Coffee. Kerala Banana (Ethapazham) : 3-4 nos. Mix Maida, Rice Flour, Sugar, salt, baking soda, Oats and a generous pinch of turmeric with enough water to make a thick batter (Idli batter consistency). Heat oil in a pan. Cut Bananas lengthwise into thin slices and dip in batter. Deep fry in oil if you like it plain. Dip the banans in the batter and deep fry till golden brown. 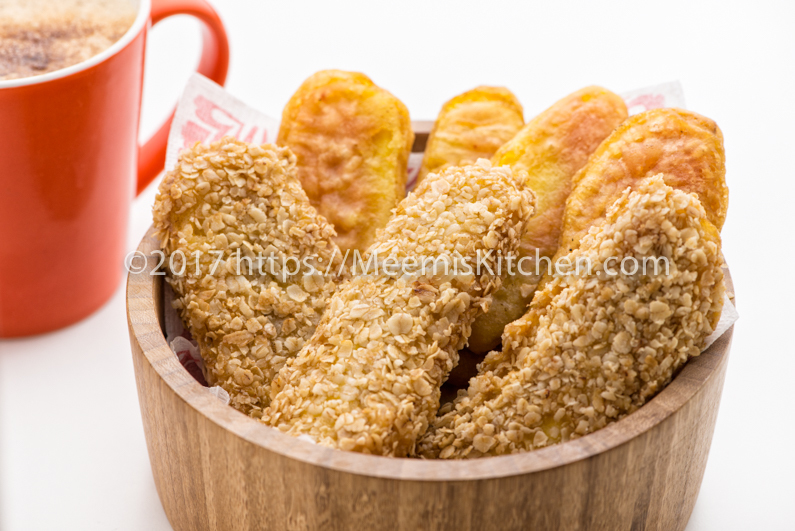 For crispy oats coating, dip the bananas in the batter first and then roll on oats (half cup) and deep fry in oil. When it is golden brown, drain and keep aside. Repeat process. 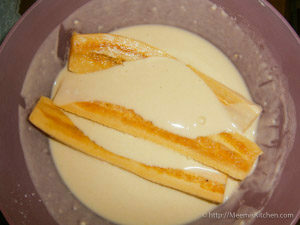 If you have only little batter left, mash some banana and mix well with the batter. Drop small portions into oil and fry the balls till golden brown. This way you don’t waste the batter. 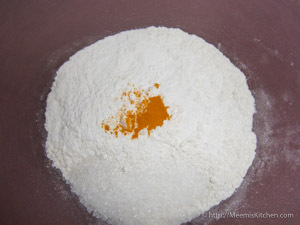 You can add a pinch of turmeric powder to give that yellow color. Just a pinch of baking soda is required. This is to give the batter a smooth, light texture. Adjust sugar as per the sweetness of Banana. Rice Flour gives crispness to the fritters. Oats has lots of fiber and you can add it to the batter. It. 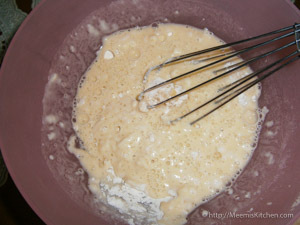 Batter will be slightly lumpy, but it is tastier and healthier. For more crispier version dip in the batter and roll on oats. Deep fry till golden brown. However this would spoil the oil quickly.Kids love this version as it gives a crunchy, crispy outer skin. Pamper your taste buds with the yummy golden Pazham pori. God Bless! !